Agapanthus or lily of the nile are fantastic summer-flowering perennials with beautiful strap like leaves. From mid summer the flowers are small trumpet shaped blooms that create the large balls on tall stems similar to ornamental onions but without the dirty foliage. Agapanthus remains luxuriant throughout the summer. They grow well in all soils and prefer full sunlight. They make the perfect plant for a pot, they flower better when they are pot bound. 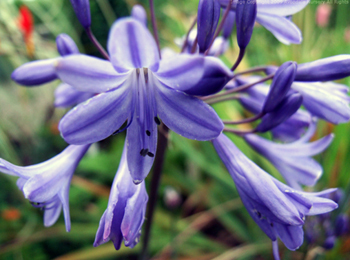 For the Agapanthus to flourish in a pot a balanced liquid fertiliser should be applied monthly during flowering. They do like winter protection with a little fleece or mulch and if they are in a pot you can lift them somewhere sheltered over the coldest 3 months. When planted in the border just cover the crown with a couple of inches of mulch once the frost has turned them to mush. They seed themselves quite freely or they divide between the eyes in winter. Every one needs an agapanthus or two at least in the garden and you shouldn't fear losing them if you follow these simple precautions.